They have revenues in the billions and make a huge difference to the world, but their low profile means that these companies are under most people's radar. A display of Adolf Würth & Co sidecutters. Not glamorous, but profitable. Image: Würth. Family businesses are often work in unglamorous sectors and have little public profile. Of course, the families controlling them often like it that way – they like their privacy. However, they deserve to have their praises sung now and again. 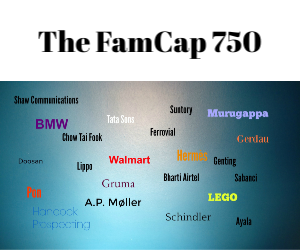 Family Capital has listed 10 family businesses which few people have heard of, but have combined revenues of $74 billion and make a big difference to the world. Adolf Würth, the holding company of the Würth Group, had annual revenues of €12.9 billion in 2013, runs 400 companies in 80 countries, and has been around since 1945. And yet it is almost unknown outside Germany. Based in the small town of Künzelsau, Würth is a huge wholesaler of materials like fasteners, screws, electronics, furniture, tools and machines. Founded by Adolf Würth, it’s now managed increasingly by the third generation – Bettina Würth became chairman of the supervisory board in 2006. Although the power behind the throne is still her father, Reinhold Würth. A huge Brazilian conglomerate involved in many sectors including steel, paper, finance and energy, in 2013 the company had revenues of $11.4 billion. Founded in 1919 and controlled by the Erminio de Moraes family, Votorantim is now owned by the third generation Maria Helena de Moraes and Ermirio Pereira de Moraes. Another Latin American conglomerate, Grupo Bal has some subsidiaries that may be well known in Mexico where it’s based – such as the country’s biggest insurer and up-market department store El Palacio de Hierro – but given revenues of $8.8 billion in 2013, it is relatively unknown. Controlled by the Baillères family, Grupo Bal’s president is Alberto Gonzalez Baillères, the second richest man in Mexico. A Dutch family business involved in the auto trading, leasing and transport industries and controlled by the Pon family since the late nineteenth century. The third generation, Ben Pon Jr, a former racing car driver, is the main shareholder. In 2013, it had revenues of $8 billion and employed more than 13,000 people. Like many big Dutch family businesses it is very private. If you find that name a mouthful you aren’t alone; these days the German purchasing and marketing holding business is mostly known as E/D/E. Owned by the Trautwein family since 1931, E/D/E’s chairman is the third generation Andreas Trautwein. The Wuppertal-based company had revenues of $7.2bn in 2013. The Japanese diesel engine manufacturer was founded in 1912 by Yamaoka Magokichi. Now owned and managed by the third and fourth generation of the Yamaoka family, it mostly makes engines for ships and agricultural vehicles. Revenues in 2013 were $6.3 billion. Founded by Maurice Varsano in 1952, Sucres & Denrées is the world’s biggest sugar trading company. It’s run by Maurice’s son Serge and had revenues of $5.6 billion in 2013. Based in Jeddah, Saudi Arabia, Dallah Al-Baraka is one of the Middle East’s biggest conglomerates, involved in a host of sectors from telecoms to tourism. Set up in 1969 and controlled by Saleh Abdullah Kamel and his family, 2013 revenues were estimated at more than $5 billion. This Danish firm is one of the world’s biggest pump manufacturers, with revenues of $4.3 billion in 2013. Founded in 1945 by Poul Due Jensen, Grundfos today is mostly owned by a foundation, although the Jensen family still own a sizeable chunk of the business. The Canadian family business can trace its history back to 1857 and is still controlled by the Richardson family today. With revenues of $4.2 billion in 2013, the Winnipeg-based conglomerate, which is involved sectors as diverse as grain and finance, is currently managed by fifth generation Hartley Richardson.